The story of Aphrodite is the focus of 'Cyber Force' #3. This compelling chapter continues to build the new world of Top Cow's reimagined original title. Corporate greed leads to murder and coercion until one doctor's obsession results in a powerful revelation. Marc Silvestri released 'Cyber Force' twenty-six years ago and this second reboot of the former flagship series rests in the hands of writers Bryan Hill and Matt Hawkins. It was only a matter of time before we'd get the whereabouts of the sentient android Aphrodite. Hill and Hawkins dedicate this issue to her story, and it's probably the best in the series so far. We get very little Carin and Morgan in order to give what is essentially an unnerving scientific horror story. Cyber Data is the organization at the center of series and the catalyst for everything that's gone wrong. While they may be forming a team with Stryker and his daughter now, they at one time recruited and funded the research of Dr. Morrigan and her pursuit of transferring human consciousness. Her tedious work made Cyber Data impatient as they bullied and threatened her to make more progress. The organization that once believed in her wanted a return on its investment or else. This exposes Cyber Data's corrupt and unethical standards that include murder. As committed as Dr. Morrigan was to find a way to transfer consciousness into an android, Cyber Data was more committed to pushing her along. This lays the foundation for Aphrodite's motivations going forward in a nice change for her origin story. By the end, it'll feel like an episode of Black Mirror where technology becomes so perverted and twisted that advancement comes at a high price. Atilio Rojo's does all the art duties here and it's excellent. The line work is flawless, the colors are deep and rich but most of all Rojo is a great storyteller. So much of the story is told reactionary expressions from all the characters. Most panels will have a character's face reacting to something and Rojo conveys all those feelings - anger, pain, shock, disbelief, concern - with expert precision. 'Cyber Force' #3 is the latest building block that stands on its own as an origin story for Aphrodite. Hill and Hawkins are taking their time introducing these characters and how they fit together. It's the right approach to be deliberate but compelling as they create this new rebooted universe for new and old readers alike. It hums with tension and suspense seizing your attention until the shocking end. 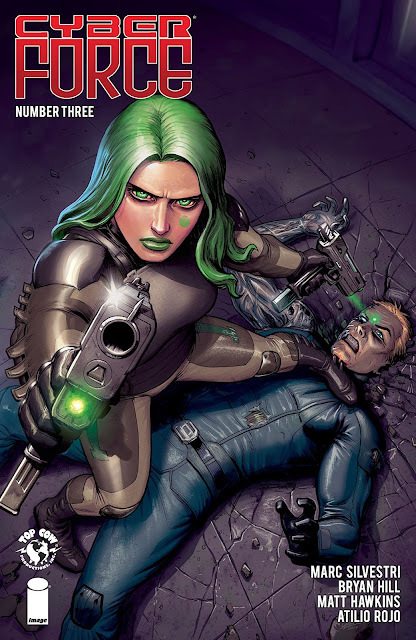 'Cyber Force' is a worthwhile read that merges superheroes, sci-fi, horror, and action into one irresistible concoction.